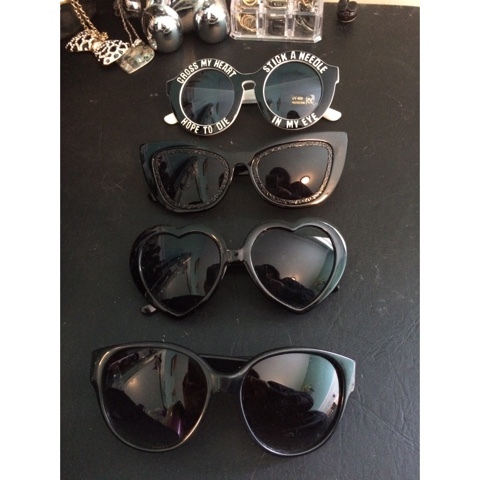 I wanted to share with you my small but awesome sunglasses collection! I feel like I have so few but they do the trick for me. First up are my "Cross my heart, hope to die. Stick a needle in my eye" sunglasses! I purchased these from SheInside.com probably a year and a half ago now. As you can see they do still have the sticker on them which means I haven't worn them yet but only because I lost them for awhile and I haven't had an awesome enough outfit to wear them with! Second pair are my newest pair of sunglasses from GlassesShop.com and you can read my blog on them HERE. 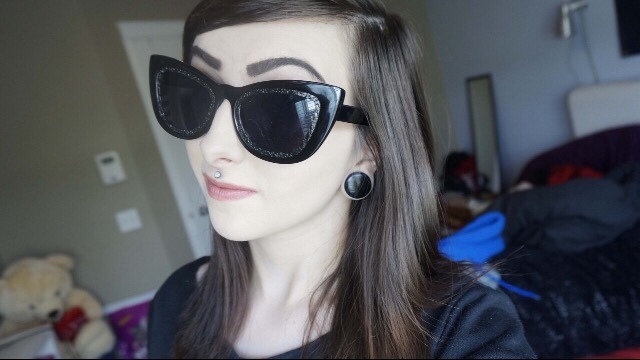 They're a large pair of cat eye sunglasses and I absolutely love them. They're quite dark which is awesome for my sensitive eyes. Third pair are a pair I bought from JoinTheKVLT.com that I got back in 2012 and you can read about them HERE. These are my favourite and have cute little pentagrams on both sides of the arms! The fourth pair is my absolute favourite and these are the ones I wear most often. They are Guess sunglasses that I bought from Winners probably two or so years ago now. I feel they suit my face well and still look stylish but spooky. If you check out my blog Instagram they are on there sometimes!